Details of the Thirkill family who lived in the Grewelthorpe, Kirkby Malzeard area. Information taken from census returns and Parish records. And the research done by Eunice Wilson. Eunice Wilson is seeking information about George Thirkill and his siblings from Kirkby Malzeard. Also the Thirkills who went to Middlesborough and Hull. The information should be checked at source if possible. If you can add any information to this page please email me. Thanks for information from Lisa Feather, descended from Ralph Thirkill. She would like to hear from anyone researching this tree. ALICE ANN THIRKILL. Born C. 1878 Kirkby Malzeard. Dau of William & Hannah. ANN THIRKILL. Born 1796. Dau of John & Jane Richmond. Married Thomas Lonsdale. in 1826. ANN THIRKILL. Born 10.11.1828/9 Aketon. Dau of Charles & Ann Petty. married Stephen Morrell?? BENJAMIN THIRKILL. Born C. 1762. Lived Galphay. Died falling down stairs. Buried 4.11.1844 Kirkby Malzeard. BENJAMIN THIRKILL. Benjamin Born 1864 Ripon. Stoker At Steel Works in 1911. Married to *Eliza Farrar. *of Stanningly. [b.1871] dau of Sarah. [b1843] Leeds. 1911 living Leeds. CATHERINE THIRKILL. Married George Leathley. Mother of Betty Leathley. [b.1766] Wathermarske. CHARLES THIRKILL. Born 1775 Grewelthorpe. Married Mary Clarke. about 1789. They had a son Charles born 1792. CHARLES THIRKILL. Born 1800. Died 22.5.1864. Son of John & Jane Richmond. Married on 1.1.1822. in Spofforth to Ann Petty. [b. 1776 dau of Geo & Martha Petty]. Charles a mechanic at Bowling Iron Works in 1851. CHARLES THIRKILL. Born 26.10.1824 Aketon. Son of Charles & Ann Petty. Married Ann Buckley. of Cleckheaton. in 1852. CHARLES THIRKILL. Born 1789 Kirby Hill. Son of John . CHARLES THIRKILL. Born 24 March 1880 Kirkby Malzeard. Son of George & Mary. A Painter & Plumber. He married on 6.1.1903 at Kirkby Malzeard to Jane Elizabeth Almack. [b.1883] dau of George. CHARLES ALMACK THIRKILL. Born C1905 Kirkby Malzeard. Son of Charles & Jane Elizabeth Almack. CHRISTINA THIRKILL. Born 1822. Bradford. Married Joseph Ramsay. CHRISTIANA THIRKILL. Of Ripon. Had an illeg son, Wm Henry, in Ripon workhouse in 1918. DAVID THIRKILL. Born 23.11.1797. Son of John & Jane Richmond. DOROTHEA THIRKILL. Born C. 1842. Buried 12.6.1844 Kirkby Malzeard. DOROTHY THIRKILL [nee Walker]. Buried 2 Feb 1776 Kirkby Malzeard. Wife of George Thirkhill. DOROTHY ANN THIRKILL. Bap. 17.5.1846 Kirkby Malzeard. Dau of William [The Sawyer] & Elizabeth. DOROTHY THIRKILL. Died 1858 York. Married John Brown. Had a son John. EDITH THIRKILL [Nee ?]. Born C. 1880 Grewelthorpe. Married in 1905 to George [Joiner]. Lived Grewelthorpe in 1911. EDWARD THIRKILL. Buried 5.4.1716 Kirkby Malzeard. Son of John of Grewelthorpe. ELIZABETH THIRKILL. Born C. 1765. Lived Galphay. Buried 21.12.1841 Kirkby Malzeard. ELIZABETH THIRKILL. Born 1777 Grewelthorpe. Died 1782. Grewelthorpe. ELIZABETH THIRKILL. Born 1778/9 Kirkby Malzeard. Died 7.2.1805. Pateley Bridge. Married Haxby Dougill. at Hampsthwaite in 1742. They had a son Thirkill Dougill. who married Mary Kidd. in 1817 at Middlesmoor. ELIZABETH THIRKILL [Nee |?]. Born C. 1814 Morton. married to William the Sawyer. ELIZABETH THIRKILL. Born C. 1841.Carlsmoor. Dau of William the Sawyer & Elizabeth. ELIZABETH THIRKILL. Born C. 1876 Kirkby Malzeard. Dau of George the draper & Mary. Dressmakers apprentice in 1891. EMMA THIRKILL. Bap. 20.8.1848 Kirkby Malzeard. Dau of William the Sawyer & Elizabeth. FRANCES THIRKILL. Born C.1738. Lived Sawley. Buried 29.8.1813 Kirkby Malzeard. GEORGE THIRKILL. Born. 1692. Died 13.5.1740 Kirkby Malzeard Son of John & Mary Fell. Married Ann Barber/Barker on 16.3. 1720/1 , father of George the bell. GEORGE T. THIRKILL. Born 1732. Buried 24.3.1813 Kirkby Malzeard. wheelwright and church warden, Name on Kirkby Church bell. Son of George & Ann Barber. Married Dorothy Walker the First of his three wives. GEORGE THIRKILL. Born 1775. Son of George & Dorothy Walker. Married Elizabeth Sharp. on 13.11.1796. GEORGE THIRKILL. Born C. 1805 Sawley. Married Mary [b.1805] from Masham. Lived Kirkby Malzeard in 1851/61. GEORGE THIRKILL. Born 1811. Son of John & Jane Richmond. GEORGE THIRKILL. Born C. 1841 Son of George of Kirkby Malzeard. He was a cordwainer. Married on 6.2.1872 at Kirkby Malzeard church to Mary Aveyard [nee Pickles]. a widow of Grewelthorpe. Banns read Jan 1872. Mary [b 1843] dau of Charles Pickles. George & Mary had 5 children. GEORGE THIRKILL. Born C. 1841 Kirkby Malzeard.Son of George & Mary. Married to Edith Lofthouse. He was a draper, shop owner & sexton. GEORGE THIRKILL. Born C. 1871 Kirkby Malzeard. Son of George the draper & Mary. GEORGE THIRKILL. Born C. 1871 Stockton. Son of John W. & Mary. GEORGE THIRKILL. Born C. 1877 Kirkby Malzeard. A Joiner. Married in C1905 to Edith[born 1879] from Grewelthorpe. In 1911 they had 1 son, George. [b.1907] they were living in Grewelthorpe, possibly Woodcroft. In 1939 they lived Hillside Grewelthorpe. George & Edith Thirkill in 1942. Both in hats. GEORGE RAYMOND THIRKILL. Born 25.5. 1907 Ripon District. Died March 1989. Son of George & Edith. In 1939 living with parents. 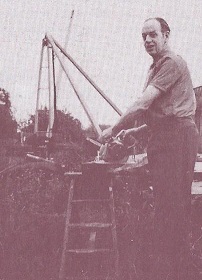 He was a carpenter & wheelwright and owned a sawmill. Living Woodcroft Grewelthorpe 1970’s. Living in Ripon 1980’s. Raymond Thirkill approximately 1970. Village joiner. HANNAH THIRKILL. Bap. 31.3.1718 Kirkby Malzeard. Buried 26.7.1718. Dau of William Thirkhill, Galwhey. HANNAH THIRKILL [nee ?]. Born C. 1842 Kexmoor. Wife of William of Sawley. HANNAH THIRKILL. Born C. 1876 Kirkby Malzeard. Dau of William & Hannah. Living Azerley 1911. HENRY THIRKILL. Born 30.1.1832 Died 23.10.1906. Son of Charles & Ann Petty. Married three times. Builder. JAMES THIRKILL. Born 2 Jan 1844 Bradford. Bap 7 April 1844 Bradford. Son of Charles & Ann Petty. JANE THIRKILL [nee RICHMOND.] Born 1769. Married in 1797 at Kirkby Malzeard to John Thirkill. Lived Follifoot. JANE THIRKILL [nee ?]. Born 27.9.1782 Masham. Died 27.7.1812 London. Widow of John Thirkill. She left £100 in her will toward the institution of a female Union Society in Masham. There is a plaque in Masham church. JANE THIRKILL. Born 1803 Died 21.3.1842. Skelding. Married Anthony Lumley. Had son John & dau Mary Jane. JANE THIRKILL. Born 1825? Dau of Charles & Ann Petty. JANE ELEY THIRKILL. Born C. 1883 Kirkby Malzeard. Living Kirkby Malzeard in 1911. JOHN THIRKILL. Born C 1670 Galphay Wood. Married Mary Fell. of Grewelthorpe. JOHN THIRKILL. Born C. 1738 Carlsmoor. Buried 15.11.1841.Son of William the Sawyer & Elizabeth. JOHN THIRKILL. Born C. 1769 Kirkby Malzeard. Died 23.3.1858. Possibly son of George . Freeholder living Deep Gill Cottage Laverton in 1851. Married to Jane Richmond of Fellbeck on 14.3.1797 at Kirkby Malzeard. John left a will dated 28.4.1854. Proved 1859. JOHN THIRKILL. Born 1799. Died 1842. Son of John & Jane Richmond. Married Hannah Simpson. in Oct 1832. Had son Charles who went to Salt Lake City to live as a Mormon. JOHN THIRKILL. Born 1805. Grewelthorpe. Illeg. son of Mary Thirkill. JOHN THIRKILL. Born C.1805 Sawley. Brother of Jane Lumley [nee Thirkill]. Living Tower St. Harrogate [a widower]in 1861 with niece Mary Jane Tyson [nee Lumley] & husband Francis Tyson. JOHN THIRKILL. Born C. 1813 Sawley. Married Ellen [b.1807] from Bramley Grange, Grewelthorpe. JOHN THIRKILL. Born 8.11.1826/7 Son of Charles & Ann Petty. Married  Elizabeth Topper. Mary Spence. JOHN THIRKILL. Born C. 1835. Lived Sawley. Buried 7.7.1844 Kirkby Malzeard. It is possible that this is the John W. Thirkill. who was recorded on the 1871 census living in Stockton with his wife & family. JOHN W. THIRKILL. Born C.1844 Kirkby Malzeard. Son of George & Mary. Married to Mary from Walker Northumberland. He was a Painter & Tinner. Living in K.Malzeard almshouses in 1911. JOHN THIRKILL. Born C. 1849 Sawley. Son of John & Ellen. JOHN W. THIRKILL. Born C. 1870 Middlesbro. Son of John W. & Mary. JOSEPH THIRKILL. Born 22 Aug 1840. Son of Charles & Ann Petty. MARY THIRKILL [Nee Fell] Buried 10.9.1733 Kirkby Malzeard. Wife of John of Grewelthorpe. MARY THIRKILL. Born 1772. Had an illeg. son John Born 1805. Lived Galphay. Dau of George. Marys son John married Ann Smith. He was a gamekeeper. Died 1854. MARY THIRKILL [Nee ?]. Born C 1845 Grewelthorpe. Married to George the draper. Helped in the shop. Living Kirkby Malzeard in 1901. MARY THIRKILL. Born C. 1875 Kirkby Malzeard. Dau of George the draper & Mary. M. THIRKHILL. In 1721 he was paid 2/- for going to Middlesmoor for a parson for the Churchwardens of Masham. Ref. 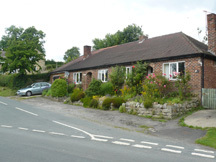 History of Masham. 1865. RALPH THIRKILL. Born 6 July 1846 Bradford. Died 1846. Son of Charles & Ann Petty. RALPH THIRKILL. Born 1853. Son of Charles [b1825]. RALPH THIRKILL. Born 1895. Son of Ralph [b1853]. RALPH THIRKILL. Born 1929. Son of Ralph [b1895]. SARAH THIRKILL. Born 24.11.1831 Aketon. Dau of Charles & Ann Petty. SAMUEL THIRKILL. Born 1834 son of Charles & Ann Petty. builder and undertaker. THOMAS THIRKILL. Born 1835. Died 27 Feb 1912.Buried 30.2.1912. Married 1859 mechanic aged 24. Son of Charles & Ann Petty. THOMAS THIRKILL. Bap. 11.8.1850 Kirkby Malzeard. Son of William the sawyer & Elizabeth. THOMAS THIRKILL. Born 26 July 1886 Kirkby Malzeard. Son of George the draper & Mary Aveyard nee Pickles. A joiner in 1911. Height 5ft 7inches. Enlisted in 1916 to the 233 Field Coy Royal Engineers. No 131297. Home address Ivy Dene K.Malzeard. In 1919 he returned home sick and wounded. Married to Elizabeth born 1890. In 1939 living Kirkby Stores as grocer and joiner. THOMAS THIRKILL. Born C1890. Son of Benjamin & Eliza Farrar. 1911 living Leeds as a mechanic Crane driver..
THOMAS A. THIRKILL. Born July 4th 1921. Son of Thomas [grocer] & Elizabeth. A motor mechanic. 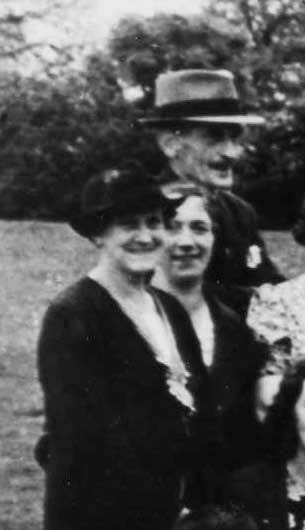 in Kirkby Malzeard in 1939. WILLIAM THIRKILL. of Masham Married on 10.1.1712 at Kirkby Malzeard to Mary Ward. WILLIAM THIRKILL. Born 2.12.1813 Sawley. Son of John & Jane Richmond. A Sawyer. Living Winksley in 1851. Married to Elizabeth of Morton. WILLIAM THIRKILL. Born C. 1836 Sawley. Son of Jo hn & Ellen. Married to Hannah of Kexmoor about 1871. Living Azerley 1911. WILLIAM THIRKILL. Born 25.6.1838/9. Died 1851. Son of Charles & Ann Petty. builder, worsted spinner at 12. WILLIAM HENRY THIRKILL. Born 8.11.1918. Bap. 28.11.1918 Trinity Church, Ripon. Illeg. son of Christiana born in Ripon workhouse. It is essential the KM line is investigated more deeply, for here lies the heart and core of the Thirkill and many more families. The line should go back to Domesday because when the Great Survey was made Thurkylls (various spellings) owned the land near and around this once thriving market town which still thrives but in different directions. Whether or not they are spring from the same origins, or all the same man, has still to be proved because the gap from 1068 to the first found in Ripon, Aldfield and Winckesley (again various spellings) among the millers of the early 1500s has yet to be filled. Thirkills and their kin also appear in the Fountains Abbey chartulary and the millers are the first names on our tree. Family history must work backwards, Nicholas and Bartholemew Thirkill appear in the Memorials of Ripon, in the library of the Minster. Of all their children David was the one who moved right out of the district, and his line in London, if any, has not been followed. John and Hannah’s son Charles went as a Mormon first to New York from Liverpool on the Emerald Isle, then to Salt Lake City to form the Mormon line there. Charles went to Bradford with his wife Ann Petty and it is from this line my own family descends. Families which spring from this generation are ‘ Lonsdale, Lumley, Brown. NOTICE OF HOUSE SALE IN GREWELTHORPE. 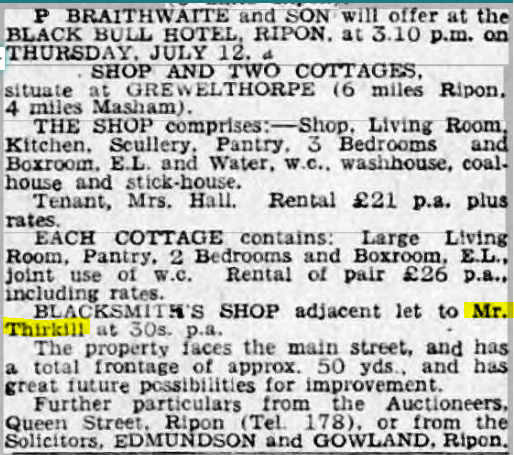 On instructions of Mr G R Thirkill, Thursday April 18, 1974 at the Unicorn Hotel Ripon, sale of a bungalow Sunnydale, Ilton Rd, Grewelthorpe, and grassland at Grewelthorpe 3 2/3 acres. Sunnydale, Grewelthorpe the bungalow on the left.